Instaflex - I am glad I saw this site. I ordered the free amples of instaflex like many. I got my product. Then I read this sirte. I called the number to find out about thesutoshipping scam I heard from this site. they said it is in the agreement that they can send you every month supply and charge you for it. I asked them to cancel it. The guy who ansered phone offer me 50 % off for the product. I told him nicely that I will try first and if I like it \i will call back. he agreed and I also asked him to email me to confirm the cancellation. he said he will do. Any for precaution I called my credit card company to cancell any further payment. they put a note on the card account that I aready cancelled the shippment of any kind.thanks every one for keeping the site alive. Review #266771 is a subjective opinion of User266771. I consulted a pharmacist about instaflex, but she said it looked like only health food stores carry it, in Canada. She checked the ingredients and found that Glucosamine Sulfate is comparable, and also probably better and a way cheaper. It was $11.99 for 360 capsules, which you take 3 times a day, about a 4 month supply, as compared to a month supply of instaflex which is about $70.00 a month. You can buy it off the shelf in any drug store. 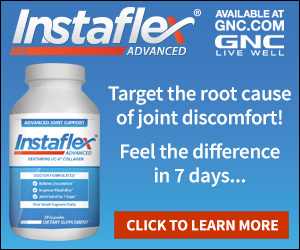 The main ingredient in instaflex is Glucosamine. To me it seems like a rip off right off the bat. I filled out all my PERSONAL info but stopped short on sending in my order after reading the fine print. First I thought the shipping cost was pretty high, then I read the info about them sending a bottle of the stuff every month and charging my account. I decided that, if I really wanted it, I'll buy it at the store even if it cost more. The moral of this story is to ALWAYS READ THE FINE PRINT.